The app was in public beta before this, but with the imminent launch of the new MacBook Pros, Apple has launched version 1.0. New MacBook Pro owners will get FaceTime pre-installed, so it appears as if this download is only for existing Mac customers. 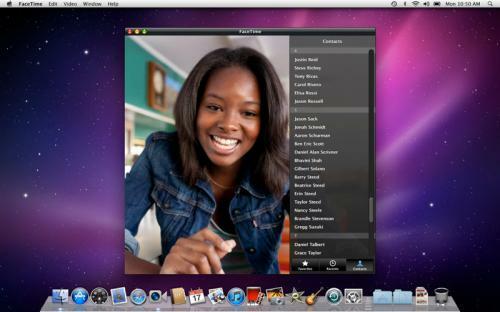 • With just one click, you can make a video call to an iPhone 4, an iPod touch, or another Mac. • View transitions smoothly when an iPhone 4 or iPod touch user switches from front to rear cameras or from portrait to landscape views. Not only the Apple Store got a major new release, the whole Apple site got an overhaul and now includes information about a lot of their new cool features. The website now includes an overview of Thunderbolt, which they all-but-confirm is Light Peak and designed in collaboration with Intel Labs (who has their own press conference scheduled for later this morning). According to Apple Thunderbolt is up to 20 times faster than USB 2.0 and twice as fast as USB 3.0. It’s a single cable that consolidates almost all existing ports, from FireWire to USB to miniDisplay to eSATA. This is one cable to rule them all. And even though the new MacBook Pros come with only one Thunderbolt port, it shouldn’t matter for end users: two 10Gbps channels on the same connector mean you can daisy chain multiple high-speed, data-intensive devices and multiple displays to the same port without using a hub… and without reducing performance. NEW MacBook Pros are here!!!! As expected the new MacBook Pros make the leap to Intel’s new architecture, Sandy Bridge, starting with the 13-incher’s 2.3GHz dual-core Intel Core i5 CPU and stretching all the way up to the $2499 17-incher’s 2.2GHz quad-core Intel Core i7 processor. Furthermore, the MacBook Pro has seen some minor enhancements, too: the entire lineup has dropped in weight, and all models feature a slightly larger trackpad than before, and they include a ‘FaceTime HD’ camera versus the iSight of previous models. Other features: FaceTime HD camera, 8X slot-loading SuperDrive, Thunderbolt High-Speed E/A and Mini-DisplayPort, 802.11N WiFi, Bluetooth 2.1+EDR, SDXC, FireWire 800, USB 2.0. Other features: FaceTime HD camera, 8X slot-loading SuperDrive, Thunderbolt High-Speed E/A and Mini-DisplayPort, 802.11N WiFi, Bluetooth 2.1+EDR, ExpressCard/34 slot, FireWire 800, USB 2.0. Apple opens Mac App Store!!! As reported earlier Apple was scheduled to open the Mac App Store today January 6th, it seems as if they kept their promise, just moments ago Apple released the Mac OS X 10.6.6 which includes the Mac App Store, all that’s needed is Snow Leopard and an iTunes account. You’ll have to download the software update Mac OS X v10.6.6 to install the App StoreAccording to Apple all of the below mentioned additions will make your life easier! 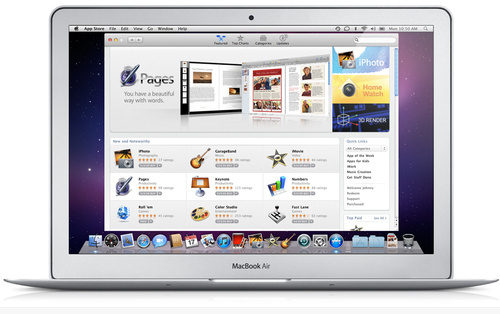 “Discover Mac apps: Browse featured apps, top charts, and categories, or search for something specific. Read detailed app descriptions and user reviews, and flip through screen shots. Thus begins our Mac App Store coverage. Stay tuned to TUAW all day for in-depth analysis and exploration. Sling Media releases SlingPlayer for iPad. It has long been rumored that Sling Media has been working an iPad version of its SlingPlayer Mobile application, for those of you who are unfamiliar with the app, it “slings” television content from a set-top box connected to a user’s television to computers and mobile devices. The SlingPlayer Mobile for iPad is now available in the App Store, however it does come with a price tag of $29.99, which is the same as for the iPhone version, even though the iPad app offers higher-resolution video than its iPhone counterpart. The whole program has been overhauled to use iPad’s intuitive native interface, and a recent channels feature puts a viewer’s recent channels at his fingertips. Currently the software is compatible with Slingbox SOLO and PRO-HD set-top boxes. There are several cool features of the app, such as the ability change channels, control your DVR, and of course watch shows over Wi-Fi and 3G. For those interested the app can be downloaded from iTunes here. If you have bought the app let us know what you think. Apple’s official iMovie app for iPhone has been updated to version 1.1. The new update requires iOS 4.1 and is compatible with the new iPod touch. The updates also adds several new features, including the ability split video clips, automatic music looping, and more. – Compatible with iPod touch (4th generation). – Ability to split video clips. – Automatic music looping when video extends beyond music track. – Scrub to preview clips in Video Browser. – In-app Tips page that illustrates how to use key features. – Updated Photos Browser with newest images at top. – Mute badge to indicate video clips with audio disabled. – Additional performance and reliability improvements. YouTube mobile website gets major upgrade! Admit it, you also belong to those that love watching videos on YouTube’s mobile website it just makes the iPhone that much better. Well the mobile version of YouTube just got that much better, thanks to some hefty HTML5 optimization. The website has a completely icon-driven dashboard which now greets the YouTube visitor clicking away on the iPhone. The dashboard offers quick and easy access to subscriptions, playlists, favorites, your videos, search and settings, and is now a lot more finger friendly. The biggest change, though, is speed: videos load much quicker than the native YouTube player, as well as gaining higher-definition options for watching on the likes of the iPhone 4’s Retina Display. This new mobile website will also work with the iPad, providing a lager interface than the iPhone website does. You can visit the new redesigned site by going to m.youtube.com. Gameloft holds sale on several iPad games! For those of you who enjoy playing sports games, or any kind of games, on the iPad this will be great news. Two of the most popular sporting games for iPad have gone on sale today, however be aware of the fact that this is a limited time offer only. Gameloft has slashed the prices of Real Soccer HD (previously $6.99) and NFL 2010 HD (previously $4.99) to just $0.99. Furthermore Gameloft also has a sale currently running on two of their other games including Hero of Sparta HD and Brain Challenge HD, both of which have also been reduced to $0.99. But thats not all, the savings don’t stop there, – as well as their sales, Gameloft have permanently cut the prices of both Modern Combat: Sandstorm HD and Gangsta: West Coast Hustle HD from $6.99 to $4.99.